Legal Fees: The amount indicated is charged by the appointed external Lawyers according to the Advocates (Remuneration) (Amendment) Order, 2014 (as varied or amended). It does not include VAT and disbursements as these will be clear after the Lawyers have completed their work. Insurance: The amount indicated above is charged by the Insurer on the basis of the Option selected by the borrower for the period of the Facility. Insurance includes Mortgage Protection, Credit Life Insurance, Fire Insurance, Property Insurance and Car Insurance, where applicable. Government Levies: This means Excise Duty at 20% of the Application / Processing / Initiation/ Arrangement/ Commitment Fees charged. The estimate provided in this calculator does not include VAT and other Government Levies. Stamp Duty: This is a Government Levy on sale of property charged typically between 1% and 4% of the value of the property. Valuation Fees: The amount indicated is charged by the appointed Valuers according to the Land Valuers Licensing (Remuneration) Notice 2013 (as varied or amended). It does not include VAT and Disbursements as these will be clear after the valuation work is complete. Security Registration Fee:The amount is payable to the Government Registry where the Security will be registered and has not been indicated within this online APR calculator. Other Third Party Costs: There are other costs associated with the facility that may not be within the lender's purview and therefore have not been factored into this APR calculator. 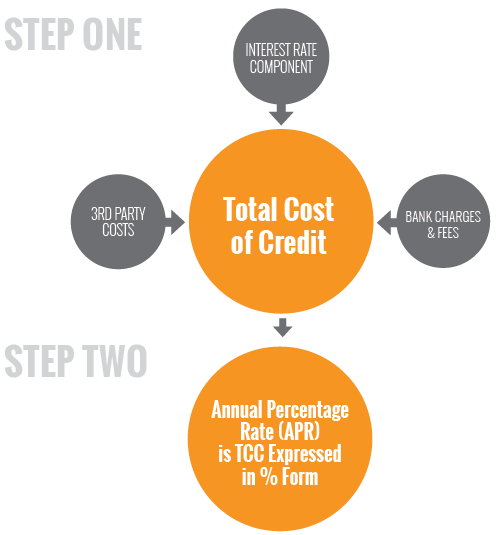 Commercial banks in Kenya have adopted the Total Cost of Credit (TCC) pricing mechanism, which enables consumers to compare different bank loan costs based on standardized parameters and a common computation model. This site provides you with information on the TCC and features a simple Cost of Credit calculator, which loan applicants can use to estimate the total cost of a bank loan. Banks are required by the Central Bank of Kenya to provide you with a Total Cost of Credit breakdown as well as a loan repayment schedule. There are various costs associated with a loan. These costs are in addition to the interest rate component, and range from bank fees and charges to third party costs, such as legal fees, insurance and government levies. Because loan applicants will tend to focus only on the interest rate when making a loan decision, banks have proactively adopted the Annual Percentage Rate or APR model which converts all direct costs associated with the loan (also known as the Total Cost of Credit) into one number. With the APR, borrowers are empowered to comprehensively compare different loan products on a like-for-like basis, based on the total cost of the facility; and therefore make better informed credit decisions. Credit Information Sharing (CIS) is a process where credit providers such as banks and licensed Microfinance Banks submit information about their borrowers to a licensed credit reference bureau so that it can be shared with other credit providers. Sharing of credit information will enable borrowers build credit history which they can use to negotiate for better credit terms. Positive credit history can also be used by borrowers as alternative collateral to traditional physical collateral. Bank customers are encouraged to check their credit scores from the licensed Credit Reference Bureaus.